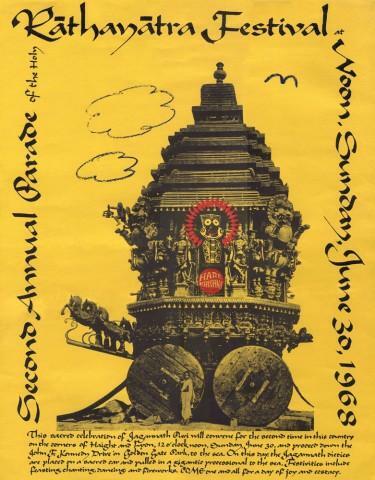 Bottom text reads: "This sacred celebration of Jagannatha Puri will convene for the second time in this county on the corners of Haight and Lyon, 12 o'clock noon, Sunday June 30, and proceed down the John F. Kennedy Drive in Golden Gate Park, to the sea. On this day, the Jagannatha deities are placed on a sacred car and pulled in a gigantic processional to the sea. Festivities include feasting, chanting, dancing and fireworks. COME one and all for a day of joy and ecstasy."